New evidence from the second U.S. Apple vs Samsung patent lawsuit has revealed that Samsung was somewhat afraid of starting a clear, full-fledged anti-iPhone marketing campaign in 2011 – a move which actually proved to be detrimental to Samsung’s success in the mobile business. However, the death of Steve Jobs provided Samsung the “best opportunity to attack iPhone,” according to a highly confidential email exchange between Samsung execs presented as evidence in the trial and obtained by AppleInsider. The email exchange presents a conversation Samsung execs had around the announcement of the iPhone 4S, unveiled during an Apple event on October 4, 2011. A day later Apple’s co-founder and former CEO passed away. Michael Pennington, then Samsung’s vice president of sales operations and head of national sales for Samsung Telecommunications America, wrote on October 4, 2011, an email to various Samsung execs wondering whether Samsung should attack the iPhone in public, or whether it should protect its relationship with one of its main customers. “If it continues to be Samsung’s position to avoid attacking Apple due to their status as a large customer, can we go to Google and ask them to launch a campaign against Apple, based on the many better Android options available in the market for Q4 ,” he wrote. Pennington however appeared not to be sure whether Ice Cream Sandwich, which was to be released on October 19, could face iOS 5. “Seems Google should be asked to carry their own weight in the battle,” he said. “However, we could arrange a co-op arrangement for them if they use [our] device prominently in their marketing campaign. Is Ice Cream Sandwich strong enough to go head to head with iOS 5?” The exec concluded his email saying that he believes the campaign was long overdue. However, what seems to have prompted Samsung to go ahead with its attack on Apple was the death of Jobs, which brought a wave of indirect publicity to Apple and its products. “Sorry to continue to push this issue, but I have seen this far too long and I know this is our best opportunity to attack iPhone. If there is no consensus on the approach I initially proposed, I will stop pushing, but I would like to better understand our strategy so I can align with that,” he concluded. Todd Pendleton, Samsung Telecommunications America’s chief marketing officer, involved in that email exchange, replied that Samsung will execute the plan. “Hey Michael, we are going to execute what you are recommending in our holiday [Galaxy S2] campaign, and go head to head with iPhone 4S,” he said. “We are working on a very aggressive strategy touting our advantages in hardware and software. In the process we will demystify the perceived Apple advantage (ecosystem/services) by showing how consumers can easily switch to Android and have more personalization/more choice by being part of the Samsung ecosystem. More to come soon… Best TP,” Pendleton said. Samsung started attacking the iPhone that winter, while reviews praised the Galaxy S2, escalating its anti-Apple marketing campaign in following years. The most effective anti-iPhone campaigns followed in 2012, with Samsung launching its “Next Big Thing” attack that became viral online. An internal email exchange from Apple revealed earlier during the trial, showed that Apple was quite affected by this particular Samsung campaign, and even considered changing ad agencies to freshen up iPhone advertising. 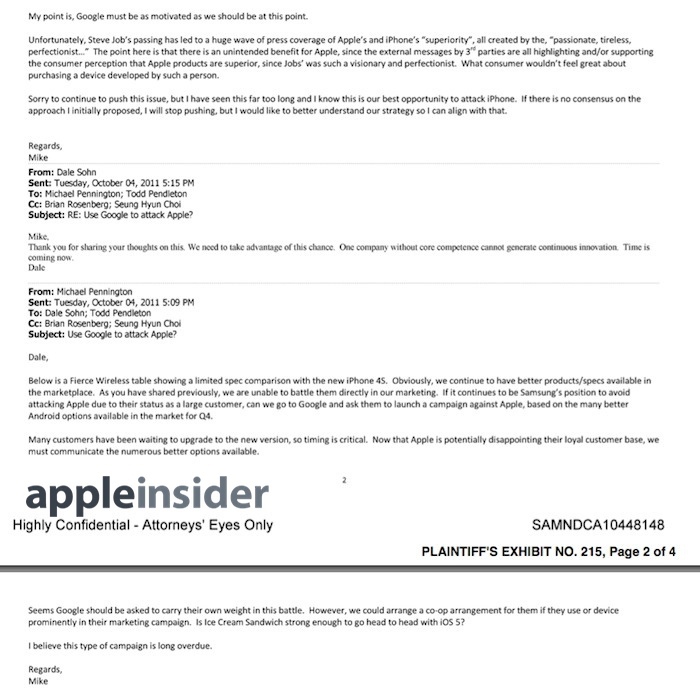 A screenshot showing Samsung’s late 2011 confidential email exchange follows below.